After traveling widely in Europe, Mexico, and Egypt intermedia artist Emit Snake-Beings arrived in Auckland on January 1, 1999. After a brief spell of success producing and exhibiting his enigmatic coin operated electrical shrines, as featured on ‘Nightline” TV, Emit relocated to the hermetic environs of Hamilton, concentrating his energies on making experimental film, obscure street theatre and the Kaosphere Orchestra. Since 2006 Snakebeings has organized the annual Hamilton Underground Film Festival, producing and screening a series of compilation DVDs of little known local and international experimental works. 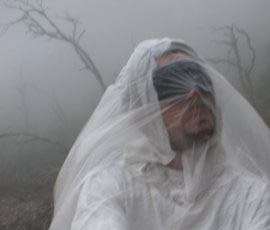 A prolific producer of audio, filmic and installation art Snakebeings also appears in the films of Michelle Saville and Carlos Pla: ELAINE RIDES AGAIN (2010, 16mm), MARTIN AND SNAKES GO TO THE ZOO (2006) and MONK (c2008). His own films include PYLON PIRATES (2005), THE REMOTE VIEWERS (2005), THE DEATH OF AN ORCHESTRA (2006), ALCHEMICAL PILGRIMAGE (c2008) all of which display a strong fascination with the relationship between technology and the occult. Some of these earliest themes are featured in the super 8mm film THE SHRINE (1993) which documents the creation, worship and destruction of three techno-magico-religious installations in Spain and Holland. His current work in progress, PETROLEUM RELICS, is set in the near future where oil products such as plastic and celluloid have attained fetishist significance.